Key Difference: Power steering is a system that helps in steering the wheels by using some power of engine. 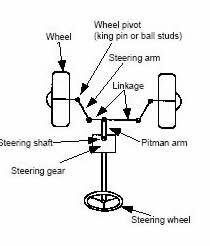 Mechanical steering is a steering system in which mechanical force is used for steering. Mechanical steering is also known as manual or non power steering. Steering refers to guiding the wheels towards the intended direction. You must be familiar with the steering systems of cars. The driver uses the steering to control the course taken by wheels. 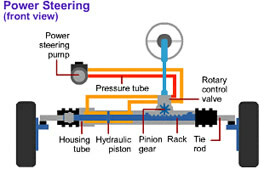 Power steering is a system that helps in steering the wheels using some source of power. Mechanical steering is totally different type of steering in which manual force is used for steering. However, today most of the cars have power steering systems. On the other hand, mechanical steering systems use the power of human muscle and due to the advantages of mechanical element, Mechanical steering system is alo known as mechanical steering. In this kind of system more efforts are required to steer the vehicles. The only energy source for the Mechanical steering system is the force that the driver applies to her steering wheel. However, power steering always allows Mechanical steering to be available; this may help in case of the problem in engine or in the case of power assist system failure. Mechanical steering is a system in which Mechanical force is used for steering. A Mechanical steering rack uses a rack and pinion, worm and roller and recirculation ball and nut.